Senate Judiciary Committee subcommittee on Immigration and the National Interest chairman Sen. Jeff Sessions (R-AL) is imploring his colleagues to join him in opposition to Loretta Lynch’s nomination as Attorney General of the United States. Sessions issued a lengthy statement on Wednesday evening after Lynch testified all day Wednesday in which he details the problems he has with Lynch and with Obama’s executive amnesty. 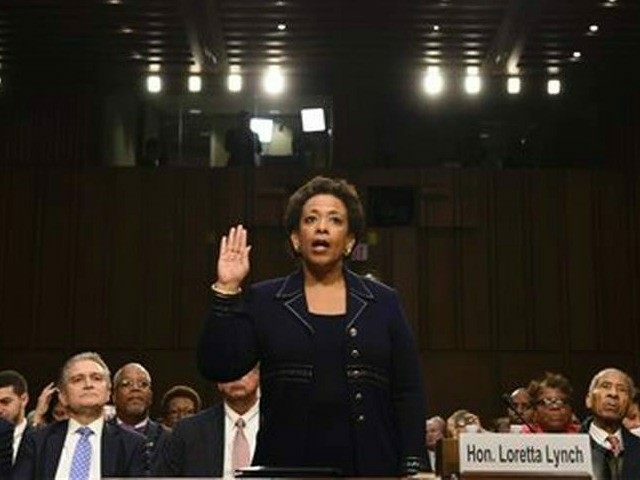 Lynch’s support for Obama’s executive amnesty is the linchpin of Sessions’ opposition to her, and Sessions will presumably be joined by Senate Majority Leader Mitch McConnell, who before Lynch was nominated—and before the election—said that a “condition” of whoever is nominated to replace Eric Holder as the Attorney General must be opposition to Obama’s lawlessness, including executive amnesty. McConnell’s office will wait until the Senate Judiciary Committee officially wraps its two days of confirmation hearings with Lynch before weighing. But his pre-election promise to oppose Holder’s replacement over immigration seems ironclad. Sessions describes why the president’s executive amnesty is lawless. President Obama’s executive amnesty represents one of the most breathtaking exertions of executive power in the history of this country,” Sessions said. “After Congress rejected the President’s favored immigration legislation, the White House met with the interest groups who had crafted that bill and implemented the major provisions of the legislation that Congress had rejected through executive fiat. Sessions then notes that at the beginning of this nomination process, he made his expectations clear: Any Holder replacement must oppose Obama’s executive amnesty. The legal opinion attempting to justify this circumvention of Congress was issued by the Attorney General’s Office of Legal Counsel. At the outset of this nomination process, I said that no Senator should vote to confirm anyone for this position—the top law enforcement job in America—who supported the President’s unlawful actions. Congress must defend its constitutional role, which is clearly threatened. Unfortunately, when asked today whether she found the President’s actions to be “legal and constitutional,” Ms. Lynch said that she did. I therefore am unable to support her nomination. Sessions also hammered Lynch about her statement that she believes illegal aliens have a “right” to work in this country, just as much so as any American citizen. Lynch attempted to somewhat walk that back later in the day with the help of Sen. Chuck Schumer (D-NY), the Justice Department and a willing Politico reporter who reframed her new statement as somehow clarifying her previous comments. Sessions concluded by citing law professor Jonathan Turley deriding Obama’s executive amnesty. Turley will be a part of the panel that testifies before the Senate Judiciary Committee on Thursday about Lynch’s nomination, and as a liberal has delivered some of the sharpest criticisms of Obama’s executive amnesty. Sessions is a senior member of the Senate Judiciary Committee and in addition to chairing the important immigration subcommittee, he served as the full panel’s ranking member during the first two years of the Obama administration. At this time, it appears Lynch will be confirmed by the Senate Judiciary Committee and sent to the full Senate after that.